Step by Step Guide to Leveling Inscription to 600. The inks that you will need, including which herbs you will need to make them. Inscription is the process of taking various herbs, milling them down to pigments, creating inks from those pigments, and then creating glyphs, cards, scrolls of stat buffing, and various other items. It’s a great way to add several small, permanent, buffs to your character. What the glyphs do is enhance one of your character’s abilities in some way. For example, Glyph of Recovery adds 20% to all healing received. Other glyphs change cooldown times, cut mana costs, increase ranges, and so on. See below for other items that can be created. If you would rather have an in-game Inscription guide, along with one for all the other professions, helping you every step of the way and showing you where to go and what to do whether you’re farming (or buying) your own materials, then here’s the place to go. Various glyphs were removed completely, others changes, and still others are now automatic, which means that you automatically learn them as you level. Just like your abilities. Each class gets about 5 or 6 of these automatic glyphs. They’re all major, no minors involved. Exclusive categories have been added for some glyphs. Other glyphs from the same category cannot be applied at the same time. For example, if you have three glyphs than affect one ability then those three are likely exclusive with one another. Herbs will stack to 200 instead of 20. 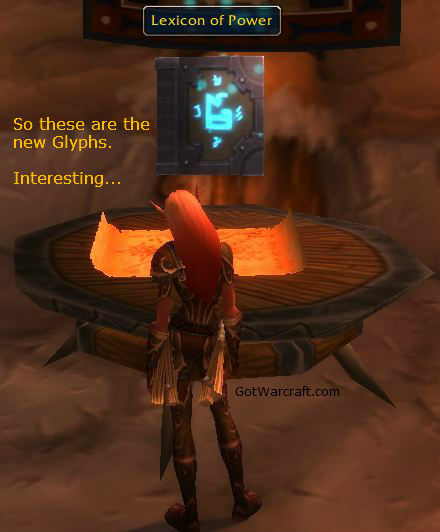 There are a number of glyphs that are Pandaria world drops and some that are Timeless Isle drops. You should be able to buy a number of these off the Auction House. Getting the drop or buying them is the only way to get them. On the AH they are referred to as Techniques. There are no rare Draenor inks, just Warbinder’s ink. If you’re in Draenor and have or get the profession, any profession, then you’ll quickly find a scroll that’ll teach you the Draenor recipes. You can use these even at level 1, which is a pretty big change from before. Zygor’s Gold Guide is updated for Warlords and will help you with gathering, crafting, auctioning and more. Basically it’ll help you to make a lot more gold. Check out the videos on this page and find out how. Patch 6.2: Endless milling is dead!!! There are 6 new recipes from the Herb Trader. Each of this will mass mill all of your herbs of one type. Get the recipe and mill those 5,000 Gorgrund Flytraps in your bags with one click. The recipes are all named Mass Mill (herb type), so Mass Mill Gorgrund Flytrap, for example. One you get the recipes they will appear in your Inscription tradeskill window, not in your professions window (where you find the milling widget.) Open up your tradeskill window, click the mass recipe you want, click “munch ’em all!” ad go get a cup of coffee. Level 90 and skill 1? No problem, you can do it all in Draenor. The “Step by Step,” below, is if you’re not yet in Draenor (under 90) and want to level Inscription. You’ll need a scroll to learn Draenor Inscription. You can either buy this from the Inscription Supplies guy in Ashran (100g, modified by rep) or you can do a quest. If the latter then once you enter Draenor you you will find a “take this quest” item, which will start you on an easy series of quests to get that scroll. Alliance will quickly find Mysterious Satchel to start that quest series. Horde will quickly find Illegible Sootstained Notes to start that quest series. Once you have it you just read the thing and you’ll learn several new recipes. Secrets of Draenor Inscription – for more recipes, such as those staves and item boosts. Ocean Tarot makes a 540 trinket. These trinkets cannot be upgraded. Laughing Tarot makes a 565 trinket. Savage Tarot makes a 580 trinket. Warbinder’s Ink – Your Warlords ink. If you’re 90+ you can make these recipes at skill level 1 and get skill-ups. They start at orange and will stay there until at least 600. Yes, this means you can skip all the other Inscription leveling bits. Just hit Draenor, grab the skills, buy a ton of materials, and level it up int he comfort of your garrison. Inscription was always easier than the other professions to level (being the newest) and now it’s even easier. If you’re not yet in Draenor you have to do it the old fashioned way, which might be reason enough to wait on it till 90+. One of the new recipes you’ll get is a research recipe. There’s no cooldown (yeah,) so you can make ’em all in one sitting, given enough ink. When you run out of Draenor recipes you’ll start researching older recipes until you have them all. The research goes gray at 605, so you’ll gt all your glyphs but you wont level much from it. Research: Warbinder’s Ink – 3 ink and 3 parchment per discovery. This creates Scribe’s Research Notes. Clicking that is what actually gives you the new (random) glyph discovery. Secrets of Draenor Inscription buys other recipes from your garrison vendor or the guy in Ashran. You do want to make an Inscription shack in your garrison and you do want a follower working there. The garrison lets you do work orders for more War Paints and some Sorcerous fire/earth/air/water. The minion will increase the War Paint production from your work orders and will let you create (once a day) a Draenor Merchant Order. Combine two of the same type and you can sell it to the vendor form some gold and maybe food. Everyday you’ll want to keep your work orders running and do your own War Paints cooldown. See the next section down if you’re under level 90 (not in Draenor.) Getting to 600 can be quite fast, getting to 700 is a bit slower. Get your scroll (see above) for the recipes. Start making your War Paints and start grinding up that Cerulean Pigment > Warbinder’s ink. Do your Warbinder’s Ink research for +5 per research, until 600. If you run out of glyphs before 600 you’ll have to make a pile of glyphs to hit 600. Making War Paints (once a day) is worth +10 to 600, +1 to 800. Each Shadowtome you make is worth +10, but costs 50 War Paints each. All of the weapons/trinkets give +10, but this is is the easiest on your mats. A milling macro (down here) will make the grinding easier. When you hit max level you will be able to stick to the highest level inks and trade them for other inks at the Ink Trader, such as Ms. Sellers, in Dalaran. Regular inks are a 1 to 1 trade, rare inks are a 10 to 1 trade. The Rare inks are needed for making items other than glyphs, such as “off hand” items, staves, shoulder inscriptions, etc. Some of those sell very well and for a pretty penny (er… gold piece) and so are worth your while. In Warlords those other items are created with your Cerulean Pigments or War Paints. At least 36 Celestial ink = 72 pigments = About 7 stacks of tier 5 herbs. 15 Sapphire pigment. If you’re lucky you got these from the tier 6 herbs you milled. Grab Dugi’s professions guide and let him keep track of it all. 4 Ebon pigment: You should have this from all the t7 herbs you’ve ground up. 10 Icy pigment, you should have these from all the tier 8 herbs you milled. At least 40 Ashen pigment = about 4 stacks of tier 9 herbs. 10 Burning Embers (for Inferno ink) which you should already have. 510-525: 37 Inferno Ink = 74 Burning Embers. And various Volatile whatevers. 40 Light Parchment plus the level 480+ materials. Note that at 500 you can easily level to with one glyph. It will stay orange,and offer +3 skill a pop, from 500 to 595. 2x Each Volatile Air, Earth, Fire, Water. You do not need any of the following items to level to 600, but if you’re interested in making items that sell fairly well then go ahead and make a few and try them out. The bracelets, eyes, etc. are available from a vendor in the Twilight Highlands, once you unlock your faction base there. They’re also, sometimes, on the Auction House at inflated prices. * From the vendor in Twilight Highlands or from the Auction House. Do it all in-game, and make a whole lot more gold than ever before. If you’re under 90 and are interested in making the various inscription items, then keep all of the Moonglow Ink and the Snowfall Ink that you make. You will need them for your Minor and Northrend Inscription Research. Starfall Ink is used for the Pandaria items, such as the shoulder enchants. Cerulean Pigment is used for all Draenor inks and many other items. You’ll use this to create your War Paints (daily “quest” and also from garrison work orders) to make the nice stuff, as well as the items to boost the item levels of the nice stuff. The other rares can be kept or sold, depending on what you want to make. As mentioned above: Any of the herbs in any group will do, you do not need to have a few of one and a few of another. Just gather whichever is easiest and/or buy the cheapest off the Auction House. You’re garrison herb farm will make some herbs for you, but it won’t be enough if you’re making any quantity of items. If you just want enough for your daily War Paints then you’ll be good. Free herbs, what’s not to like? You can use something like Auctionator (see image) to make shopping lists which will make buying easier, whether you’re buying herbs or inks. Glyphs come in two flavors: Major, and Minor. In addition to glyphs you can make books (off-hand items,) a few relics, stat scrolls, self-only shoulder enchants, enchanting velums, origami objects, and a few other items. Buy a Virtuoso Inking Set from the Inscription supplier. Buy a stack of the appropriate herb (see below for the herb lists.) You might also be able to buy the inks or pigments directly off the Auction House and skip the milling step. Mill the herbs into pigments. Process the pigments into inks. Grab a stack of the appropriate parchment from the Inscription Supplies Vendor or Trade Goods vendor. Make your items. Every glyphs costs three inks and one piece of parchment to make. Other items, such as Relics and Darkmoon Cards, will require additional mats, such as Eternal Life or Frozen Orbs or Volatile Whatever. Warlords: Research: Warbinder’s Ink – discovers all of the glyphs that use Warbinder’s Ink and then researches lesser inks. You need to have Draenor Inscription to have access to this. There’s no cooldown, either. With enough Warbinder’s Ink you could research all of the glyph recipes in one sitting. Book of Glyph Mastery– These books are rarely dropped from Northrend mobs. They’re green and BoE and can be traded or sold.There was a rumor that the need for these books would go away in patch 4.2, but that was changed by Blizzard. You will still need to buy or find these books to get the Glyphs that are unique to them. Spend a ton of gold (figure a couple hundred per book) and learn a bunch of glyphs quickly, w/o the research cooldown. As of 4.3 there are 54 Glyphs that these books will teach. The books will not teach you any other glyphs. I suspect your Draenor research will cover all of these glyphs. Scroll of Wisdom: Creating the scroll also provides you with a random Mists of Pandaria glyph recipe. The scrolls themselves are used to create a few items. Drops – In the Mists of Pandaria many glyphs are world drops in the Pandaren lands and the Timeless Isles. They can be traded so you might also be able to buy them (referred to as “techniques”) on the Auction House. The old way: To install a glyph you needed to buy, beg, borrow, steal, or create an appropriate glyph and then find a Lexicon of Power. Generally these are (still) located next to the Inscription trainers. The new way: Just like an item enchant, you buy the glyph and “right click” it. You will permanently “learn” it by doing so. All glyphs learned will be listed on the “glyphs tab” of your talents window. 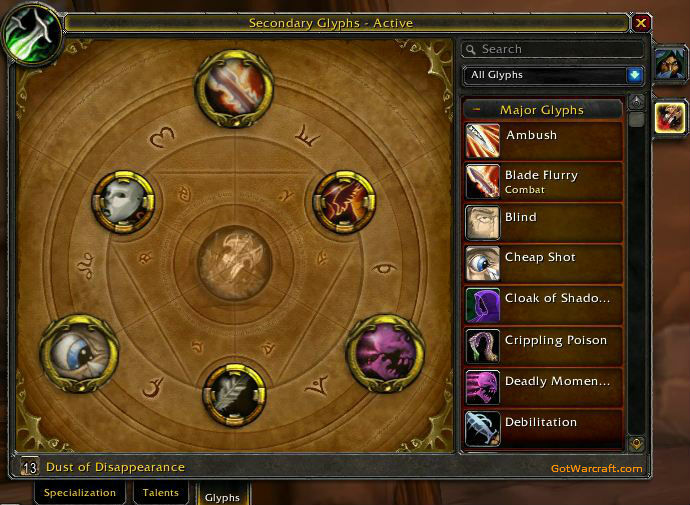 Right click a glyph in your list and drop it on the appropriate slot. To install a glyph just drag it from the right area to the appropriate slot in the left area. Note the Dust of Disappearance at the bottom. This is required to change any installed glyphs. This means that you can reset your glyphs for any particular situation. If you’re level 80 or lower you can use Vanishing powder instead, also found at the same vendor. Keep a stack in your bags at all times. Need a couple of glyphs for one boss, but others for a different boss? No problem, just swap them. This also means that once they are learned you will not need to ever again buy those glyphs. Buy them all, learn them, and then swap back and forth as necessary. Scrolls of <stat.> Scribes can create all those Agility/Int/etc. scrolls. Want a bunch of +100 Agility (or Int or Str or Spirit) buffing scrolls? Make them. Vellums, which allow Enchanters to place enchants on scrolls, and then pass them around or sell them like any other scroll. Cards – Darkmoon cards of various levels can be made by Scribes. Relics – Just the thing for Paladins, Death Knights, and Druids. You will be able to make item level 377 PvP relics and i359 PvE relics. Fortune cards – Get a chance to win!! Forged documents – Forge some incriminating papers then hand them to someone in exchange for a sack of gold. Relatively cheap to level – You won’t need exotic items, such as TrueGold, and you can level the entire way from 1 to 600 for much less than the materials cost of some Engineering items. Pretty much the only thing you’ll need is herbs and supplies from the Vendors, but see #2. Cataclysm relics and items will require some Volatile items (Earth, Water, etc.) and some require other items which can be found on a vendor in Twilight Highlands. Alliance vendor, Horde Vendor. Access to the vendor will require you to do enough of the Twilight Highlands quests to get portal access to Storm or Org. Alternatively, you can often buy them off the Auction House, usually at a small premium. Mists of Pandaria items generally only require the usual inks, but a few require Spirits of Harmony and/or Scrolls of Wisdom. You don’t need these to level the profession. Glyphs are cheap enough to make that you can make and learn all the glyphs for your class, probably for less than 500 gold. Tomes, cards, shoulder inscriptions. and more. To train up to max skil see the Inscription Trainer in any of the Azerothian capital cities. You don’t need to do any special recipe quests, just buy the recipes and skill promotions from the trainers. Ask one of the city guards for exact directions. As for the inks, you can actually trade for the necessary inks. In Mists of Pandaria you can trade your Ink of Dreams for any of the other inks you might need, including rare inks. The ink trader will be close to the trainer. To make any of the ink needed for Inscription yu will need to have some herbs, which is why Herbalism is the perfect companion skill for Inscription. The herbs are milled into pigments, and each milling requires five herbs. Each time you mill a 5 stack you will receive 1 to 4 (usually 2 or 3) common pigments and you might receive a rare pigment. The latter is used for the special inscriptions, such as cards. Generally any stack of 20 herbs will yield 10 pigments (5 inks) and one or two rares. Note that higher level herbs will give a slightly higher quantity of pigments than lower level herbs. For example, Cinderbloom gives 1-3 Ashen Pigments and Whiptail gives 1 to 4. You will also need a higher level of skill to mill the higher level herbs. Once you have your inks you will need parchment to create your glyphs and other items. All parchment papers can be bought from the Inscription Supply vendor next to the trainer. The cool thing about the herbs required is that you can use any of the herbs from a set of herbs, rather than just one herb. To create Midnight Ink, for example, you can use any of these herbs, five at a time: Briarthorn, Bruiseweed, Mageroyal, Stranglekelp, or Swiftthistle. Use whichever is cheapest or easiest to buy/gather, the drop rate of the pigments is exactly the same for each of the herbs in a set. Note: You don’t need all of the herbs from a group, any of the herbs from a group will do. So use whichever is cheapest. Also notice that you don’t need exotic herbs, such as Fel Lotus or Frost Lotus. See the next section for the herb lists. All glyphs only require one piece of parchment. Items such as Tomes will require more materials, and a few items require mats that aren’t inks or parchments, such as the Frozen Orb, required by Faces of Doom. The new relics, such as Tatooed Eyeball, will require items that are either dropped by various mobs or which can be bought from a vendor in Twilight Highlands (you have to do some of the TH quests to get access to these vendors.) In addition, you will need some of the Volatile Air etc. These mats also appear on the Auction House at, usually, higher prices. Still, making these relics will cost you a tiny fraction of what it costs to make high end Blacksmithing or Engineering stuff. This works out to a cost of about 12g per glyph. Whether or not you’re gathering your own herbs, buying the pigments and inks can save a lot of clicking. Leveling Inscription is just about the same as leveling any other crafting skill. Buy a bunch of mats, camp the trainer, buy whichever skills are available, train the skill while it’s orange (if possible,) and so on. Same here, with a couple of differences. All Glyphs award three skill points each, while orange, so you will usually be making two at a time for your 6 points. Scrolls, inks, misc items, shoulder enchants, cards, etc. award one point each. The skill level 475+ books and relics award 2 points each. The skill 500+ books and items reward 5-10 or more points each, but some require rare items (eg: Spirits of Harmony) to make. The Mists of Pandaria glyphs break this pattern. They will stay orange from 500 to 595. You can level from 500 to 600 by making 35 or so copies of any one of these glyphs. Every five points, usually, you will get your new skills. Which glyphs to pick as you level? It doesn’t matter. They all cost the same and give the same number of points. Pick the ones that you or your friends can use or that you can sell. 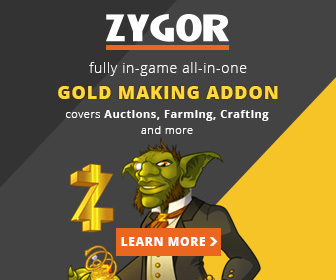 You can use your own Auction House research for the selling part, or use an addon like the tycoon gold addon. Remember that they gray out very quickly. If you’re bored of crafting you can make money by selling the inks. While it sounds expensive to buy a ton of herbs, keep in mind that you can probably level Inscription from 0 to 600 for less then the cost of a few advanced points of something like Enchanting or Blacksmithing and for much ess than the cost of one MechanoHog. Just add in the names of the herbs you’re using. There is a limit to how many lines you can have in one macro, so if you end up milling lots of different herbs you will want two or more macros. Note: All stacks of herbs in your bags have to be in multiples of 5: 5, 10, 15, 20. If they’re not then the macro will be unable to continue. For example, if you have two Cinderbloom herbs left over then you will get an error message that says something like, “not enough herbs…” regardless of how many stacks of any other herb you might have. Also, If that stack of 2 Cinderbloom comes first in your bags, before larger stacks, then it will stop the macro. So either put those 2 herbs in the bottom of your bag or send them elsewhere. All your herbs should be in stacks of multiples of 5. Warlords of Draenor looks like it will be increasing the herb stack size to 200. A nice change. I’ve made a ton of gold (see pic) with inscription since it went live, one month before Wrath was released. (Since the 3.1 patch that number is much higher, I bounced off the old gold cap.) As far as I’m concerned it’s a pretty killer money maker, though it takes a bit of work. Even in Warlords it’s pretty good. There are a ton of interesting ways to make gold in WoW, this is just one of them. While I did most of that with glyphs you can make the other Inscription items and, of course, the are all the other crafts. What’s really handy is knowing what’s selling and how nice the current prices are (nice for selling, that is.) One thing that will be a big help in determining that is Zygor’s gold guide. It’ll help you with your crafting and even your gathering, farming, and Auction House playing (buy low, sell high.) It’ll even show you how to farm transmog gear, which often sells for some pretty nice prices. There’s a number of videos on the page which will explain how it all works. Check it out, here.